I’ve wanted to have a couple of LED stars in my display, so bought a couple of these (eBay link). They were around $100 delivered for the two. They come with a multi-function controller that offers various chase speeds or a steady on mode. A 24V AC (10.8VA) plugpack is also included. But… I wanted to run these from my DC controllers, so the MFC box and plugpack were discarded and I set about working out what DC voltage they need to run at a similar light level. 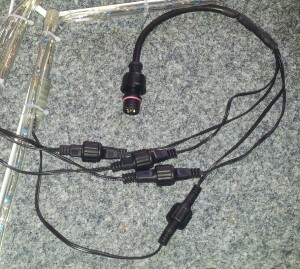 Since I have two stars, one was set up with the MFC set to the steady on mode. That way I could compare the original light levels (on AC via the MFC) to a DC source. I cut into one wire of one of the cables between the MFC and the star, connected my multimeter (set to mA) in series and saw that the current was approx 70mA. So out came the variable DC power supply with the current limit set to 200mA and the voltage set to 24V. I increased the voltage until the same colour star looked to be the same brightness on both stars. The “sweet spot” was in the 28.5V region, so I needed to drop 1.5V if I wanted to run them off the 30V DC power supply and controllers. A standard 1N4004 diode drops about 0.75V, so two of those in series will work nicely. 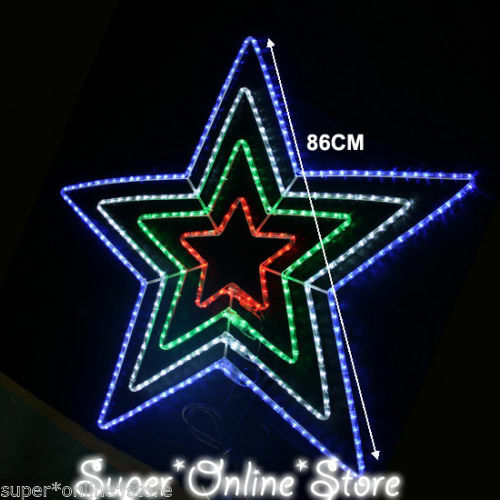 A quick test showed that at 30V with 2 series diodes, the stars (inside to outside order) drew the following currents; red: 50mA, green: 40mA, white: 90mA, blue: 115mA. 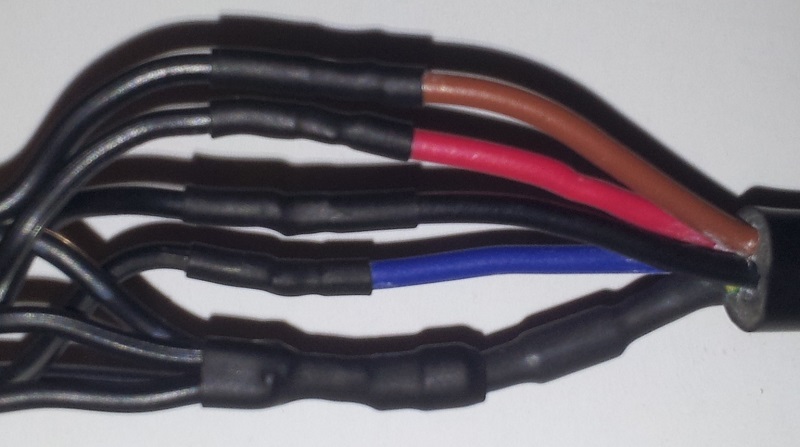 The two 1N4004 diodes are wired in series with the common V+ wire. The diode cathodes (striped end) point towards the common for the stars. 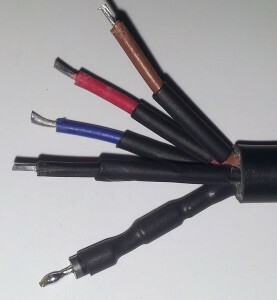 Heatshrink is used to cover the diodes and the channel connections. 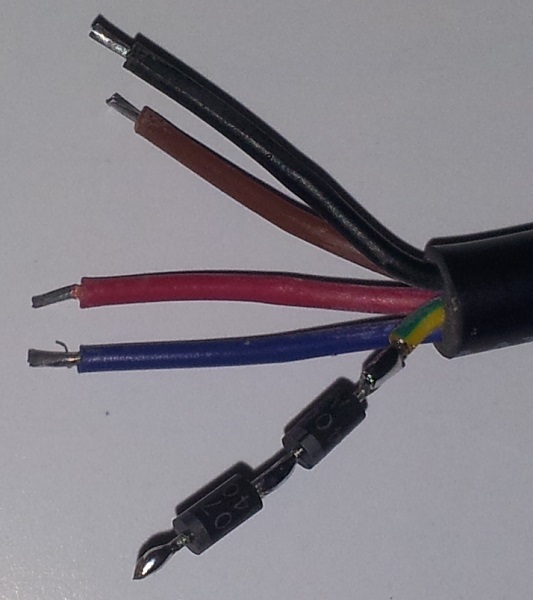 Everything is insulated individually before the overall heatshrink is put on. A male 5 pin connector splits out to the four 2 pin female connectors that I cut off the original MFC. Here’s the completed wiring harness, but without the DE9 connector back shells. 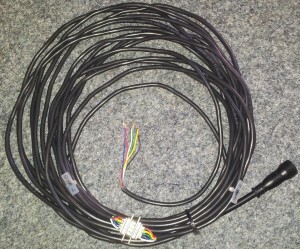 The male DE9 connector goes on the main part of the wiring harness and the female DE9 connector goes on the short tail that wires into the DC controllers.